The Muslim Anti-Racism Collaborative (MuslimARC) is a volunteer-driven education organization. Launched in early 2014, our members came together on the issues of anti-blackness and racism in Muslim communities after witnessing and/or experiencing too much of it. 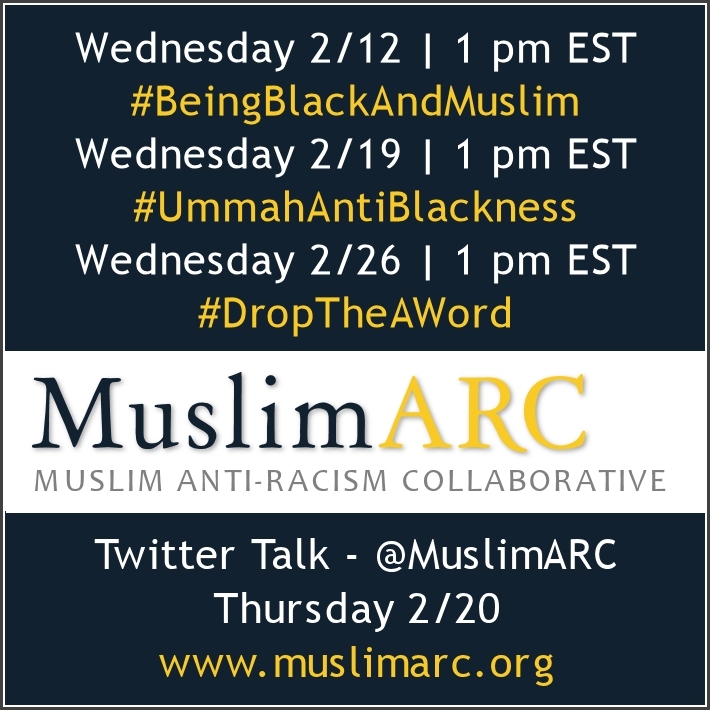 Together, we are working to build and collect the tools needed to creatively address and effectively challenge anti-blackness and racism in Muslim communities. We are a group made up of imams, teachers, parents, lawyers, students, artists, and activists of all backgrounds, including varying ethnic and religious identities. Collectively, we organize Twitter hashtag conversations, crawl the web for scholarly materials, network with clergy, write articles, take classes, and examine our own privileges and biases while researching teaching methodology and community workshop models for use by the general public. I put together a Storify to tell our organization’s birth story. I’m asking for parents of school age children to complete the following form. I need over a hundred respondents to provide valuable insight into the Islamic school experience. This data will be followed up with more in depth interviews with parents, teachers, students and administrators. Please share widely. Please take a few minutes to complete the survey below if you have school age children.